This adorable naptime plush lamb is cuddly soft and is sure to become one of your daughter's favorites. 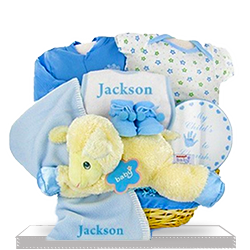 Included in this adorable basket are a personalized fleece baby blanket and bib. 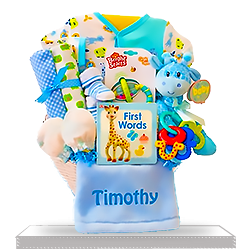 Along with these special items comes an all natural cotton sleeper, bodysuit, and booties. 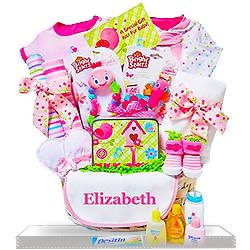 Added for that special touch is a pink and white tin with tiny baby handprints for the design. 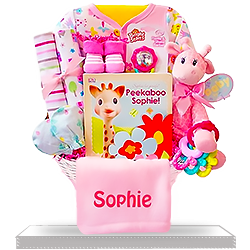 Presented in a pink, fabric lined basket, your gift will surely be remembered. Everyone loved the basket! This website is so easy to use and makes purchases so simple! Will use this again and again! Thumbs up on this item. This gift was BEAUTIFUL! A big hit. Thank you so much for the excellent customer service and delivery! Excellent service. I couldn't find any better gift for my best friend's baby girl. The service is really good. Highly recommended! Thank you for a great gift basket. The presentation was fabulous. The delivery time was as expected. I will definitely order from you again. 5 stars!! It was beautifully arranged. I will definitely be back when searching for another gift. Please keep up the good work!!! My friends reported that the gift was very impressive. Presentation was beautifully executed. The basket can definitely be reused, it is very nice. Thank You! My friend was super happy with the gift and the products! Excellent quality and service... 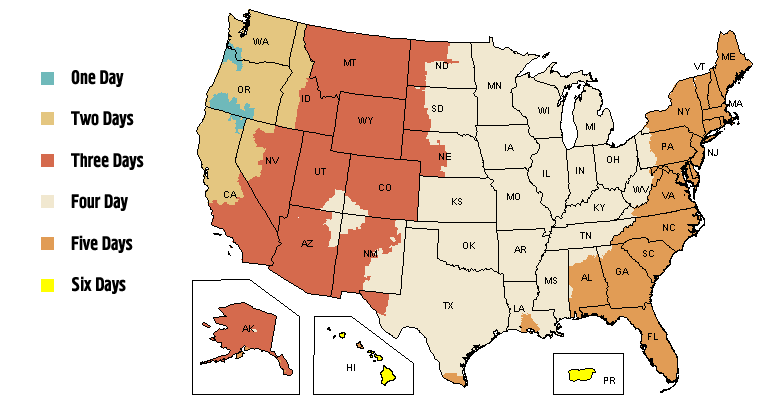 I will use this site for the next occasion. This was beautifully packaged and arrived on time. The presentation brought a smile to my recipient's face. More than we expected. Complete surprise. Sometime,when you order something, it never looks like the picture.. but this was perfect!! Recipient absolutely loved it!! Delivery was right on time. The gift arrived quickly after I placed the order and my sister loved it!! We received many compliments. Would recommened this site to all my friends! When I received it I noticed that it had a spot on its back so I had to ask for a replacement. 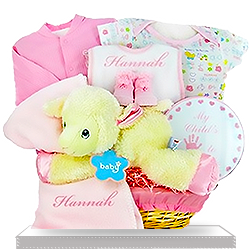 It made me nervous because I hadn’t a lot of time to wait but they turned to be very helpful and replaced my order faster than I expected so I wasn’t late with a baby shower gift for my new niece. 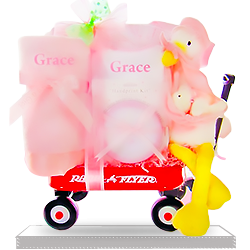 We all were thoroughly delighted and thrilled by this baby gift basket when we received it! It was an unexpected surprise from our relatives who live abroad. Love this. I hate to choose gifts. 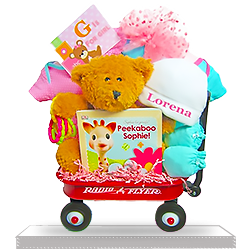 Never know what people want to get, especially when it’s a baby girl who hardly knows what she would prefer to receive. The parents told me they loved it but how can I know whether they told me truth?